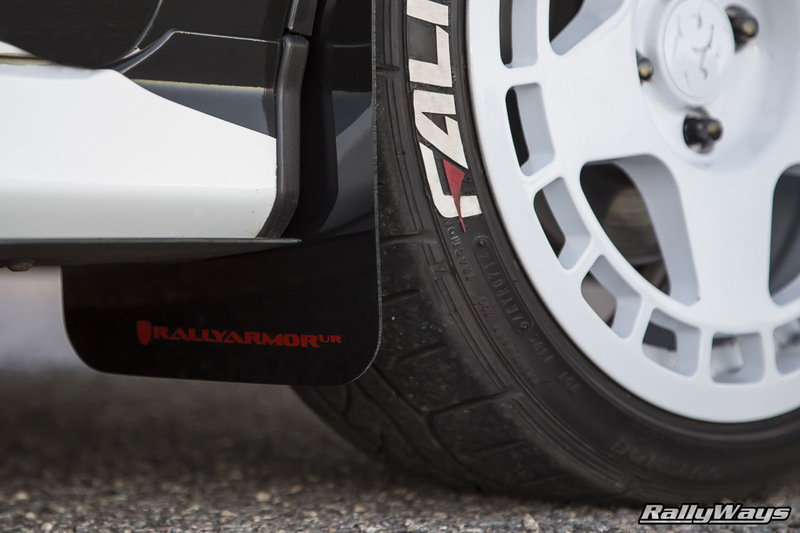 These are Rally Armor Fiesta ST mud flaps in black with red logos. 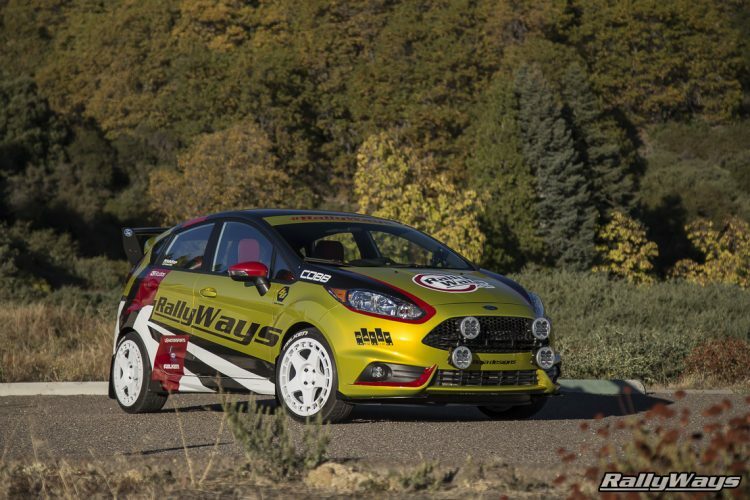 These mud flaps are the latest addition to the RallyWays Ford Fiesta ST build — #RallyFist. The Rally Armor Fiesta ST mud flaps took a quite a while to be released in comparison to the more popular Focus ST. However, the wait was well worth it. The fit is absolutely perfect. The hardware included with the mud flap kit is well designed and fits the car very well. The flaps themselves are made from urethane. They are super flexible, tough and do not transmit vibrations like a cheap plastic would. This is actually very important. When rocks and dirt hit the mud flaps, the dampening effect of the high-density urethane absorbs the sound and vibrations and turns them into tiny little thuds. The vibrations stay at the mud flap level, so they are perfectly quiet up where your ears are. The same thing goes for wind noise and road vibrations. The Rally Armor mud flaps for Fiesta ST don’t vibrate in the wind. This is something I hadn’t really thought about until I had them on the car. Then I started comparing them with the cheap plastic mud flaps that came with my 2013 Toyota Tacoma and realized the difference. The quality of the Rally Armor ones is something else. The Rally Armor Fiesta ST mud flaps are one of just 3 things that were installed on #RallyFist outside of my garage. If you’ve been following the other stories related to this build, you will realize the build was all done in my tiny garage almost in its entirety. 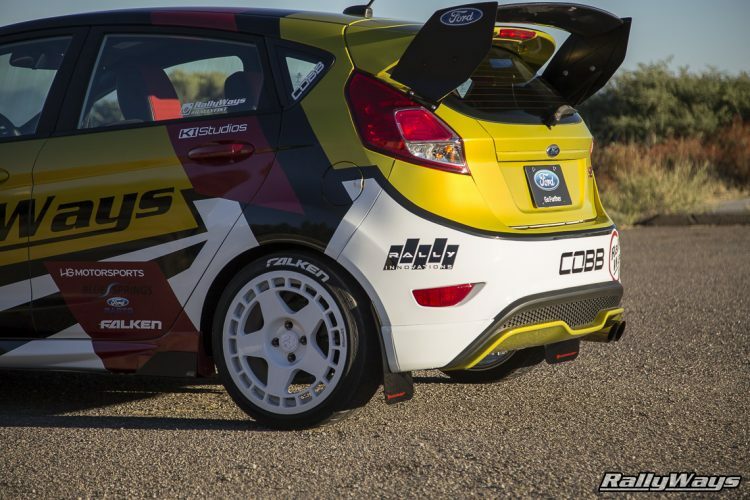 However, the livery wrap itself, though designed by me, was installed at KI Studios Car Wraps in San Diego. Then the Rally Innovations wing was installed at their shop. Finally, just a few weeks ago, I took the car to Rally Innovations for a video shoot. I had the Rally Armor mud flaps with me at the time but had not had time to install them. John at Rally Innovations was kind enough to install them while they were working on the video. That all said, they are a very easy install. They take a little longer to install than you might, but it’s mostly due to making sure they are level and adjusted correctly. After that, it’s all good. 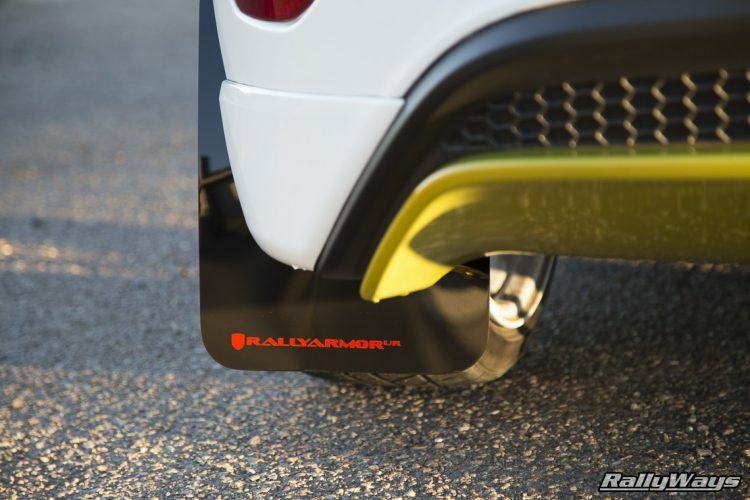 Some say the Rally Armor mud flaps for Fiesta ST are really expensive at around $160. However, you get what you pay for. Rally Armor designed these mud flaps to be the best mud flap money can buy. This includes the level of R&D, design and fit as well as the quality of the materials. I’m very happy to have finally gotten the Rally Armor mud flaps on my car. You can’t really have a rally car without mud flaps. And yes, I’ve been using them. In fact, as I write this, it’s raining outside and my car is sitting on a dirt road waiting for me to drive off and fling a bunch of dirt into the mud flaps. It’s their purpose in life after all. For more, go to the product page on the Rally Armor website.